I’m always finding ways to spruce up a salad, and we usually grow our own lettuce which includes several different varieties. 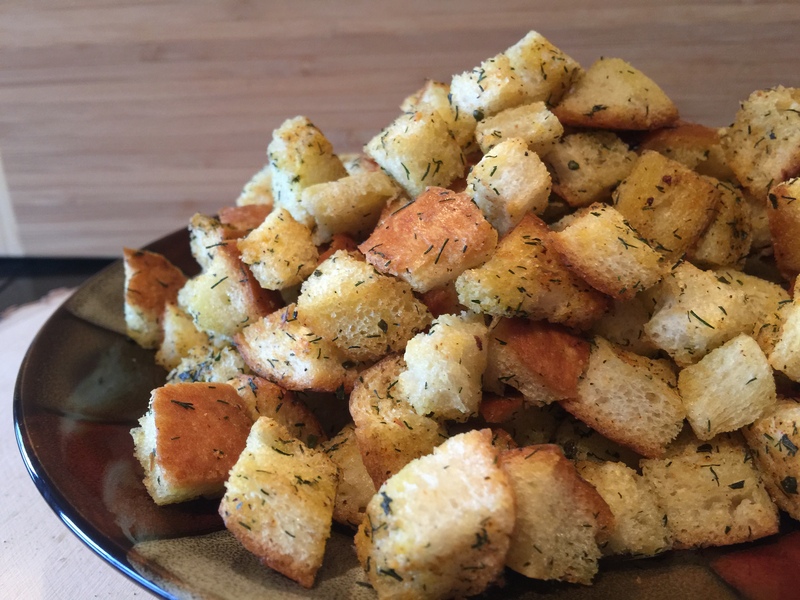 Unfortunately, this time of year we’re still buying it at the store, but I wanted to share our homemade crouton recipe with you. We’re using our Zesty Moose Willow of a dillo Dill Seasoning and our Chef’s Blend Olive Oil, which is very light and delicate; perfect for this application. 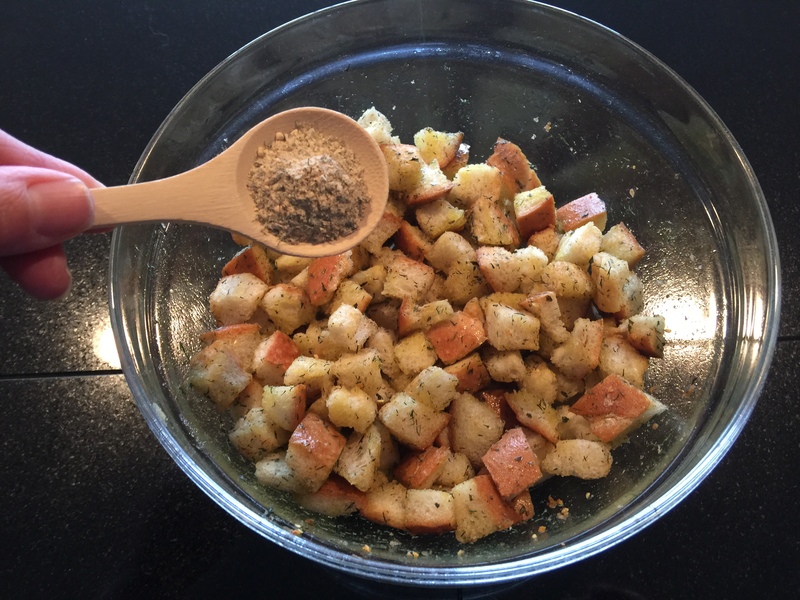 Croutons are great as a salad topper and our version is a lot healthier, and it’s about one third of the price you would pay when buying them in the store. 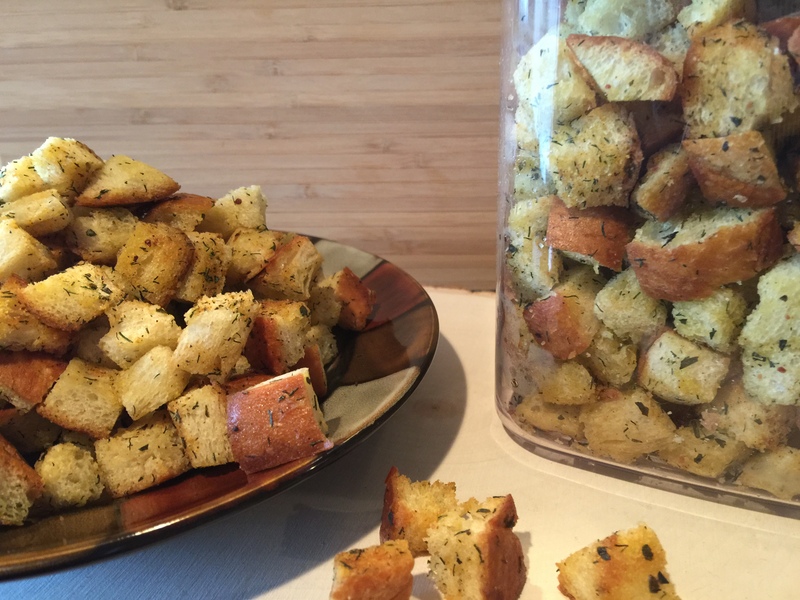 This is a great way to use up that day old bread! 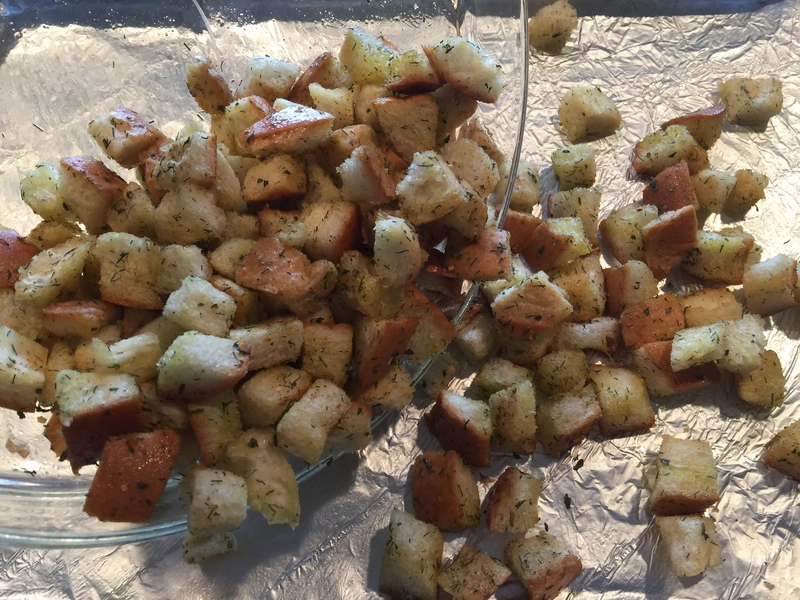 Cut the bread into ½ to 1 inch cubes. 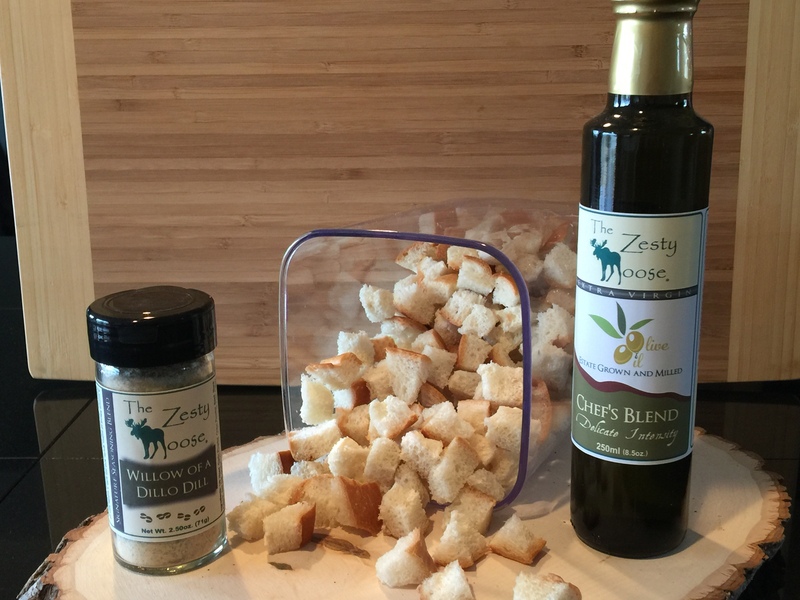 Place the bread pieces into a bowl and drizzle with the Zesty Moose Chef’s Blend Olive Oil over the pieces and mix until the oil has completely absorbed into the bread. Next, generously season the bread pieces with the Zesty Moose Willow of a dillo Dill Seasoning. Line a baking sheet with aluminum foil and lightly spray using a non-stick cooking spray. 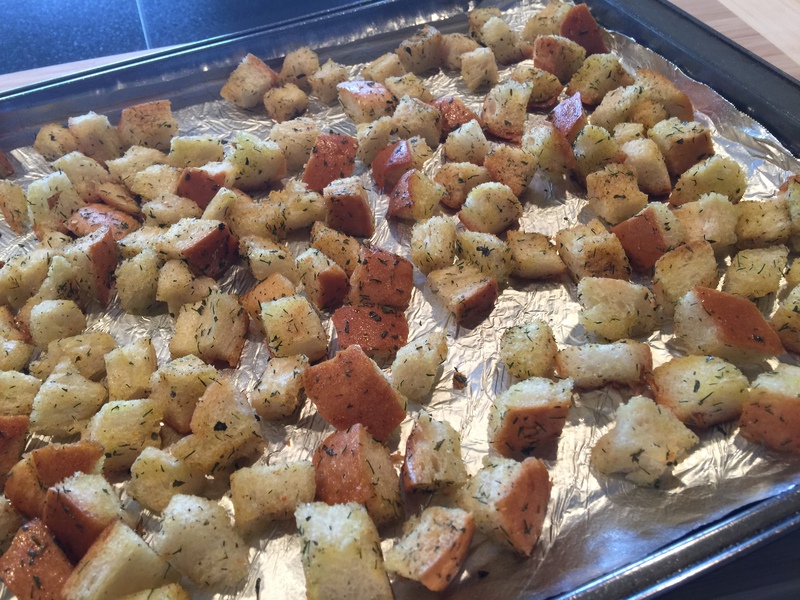 Spread the cubes evenly and bake in a 350 degree oven for 5 minutes, give them a stir and bake for another 2 minutes. Let cool and place in an airtight container. Garnish your favorite salad! 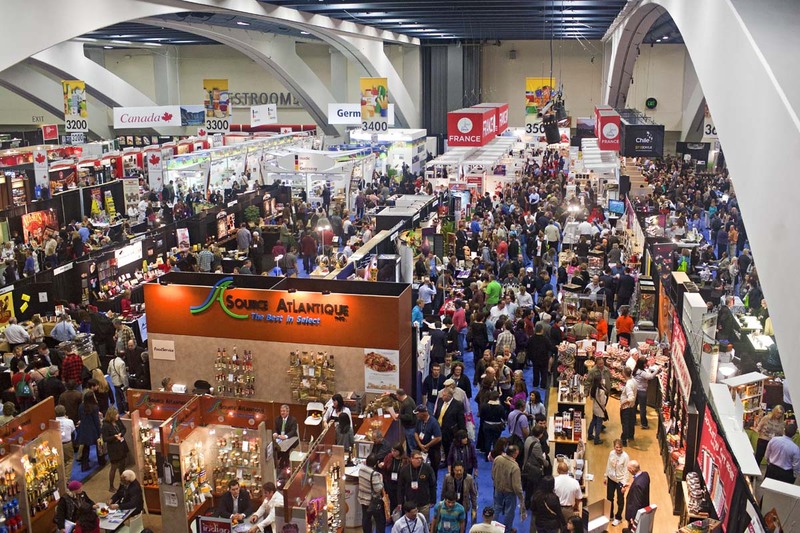 My recent trip to the Winter Fancy Food Show in San Francisco showcased over 1,400 exhibitors from across the US and 35 Countries and regions specializing in some of the most amazing and exotic foods and trends for 2015. Snack foods and bars have gone to new levels which include seaweed to unexpected ways to elevate veggies. Exotic teas and drinks are gaining in popularity. Bitter, fermented foods and drinks are on the rise. Smoked and grilled foods remain popular. Incorporating ingredients into foods that offer health benefits is a huge plus. Consumers are paying even closer attention to food labels. According to Mintel, ¾ of American Adults consider themselves foodies. One of the trends for this year has consumers wanting an adventurous culinary experience in addition to simplicity. I had the opportunity to get a firsthand look at some of this year’s top food and flavor trends. Consumers are acquiring a more sophisticated palate for spicier and more complex flavors such as Asian and new regional style foods that include exotic dishes from other regions like Thai Japanese, Filipino and Vietnamese. Seaweed showed up in a multitude of snack foods such as chips, hummus and popcorn. Seaweed also has its health benefits and is chocked full of thyroid-supporting iodine and vitamin B-12. Food Artisans have managed to turn vegetable haters into lovers by making them the star ingredient in a convenient and healthy snack food. For starters we have Broccoli Chips with White Cheddar, Brussel Bytes; how clever is that? If you are really adventurous; give the Arugula Cabbage Veggie Crunch a try! Companies are getting innovative when it comes to snack food and health bars. Consumers are embracing the unusual combinations of ingredients and flavors in their favorite snacks and bars. Savory flavors like Roasted Jalapeno, Sweet chili and even honey-smoked barbeque top the list. Sweeter combinations include Orange Honey or Cherry Pistachio. How about Sundried Tomato with Basil or Olive with Walnuts for a new twist on flavor! Consumers are looking for bold flavor food experiences. Craft Beers, Dark Chocolate, Coffee and Arugula have maintained their popularity. Consumers want to try even stronger and more intense flavors with darker coffees and chocolates, hoppy beers, cocktails with bitters and vegetables such as kale and collard greens. Public health debates continue about added processed sugars and high levels of sodium being put into our foods. Consumers are on the lookout for ways in which to reduce sodium and replace processed sugar with alternative sweeteners. Diabetes and obesity are on the rise, and the attention towards food labels continues to grow. The FDA has recently issued a recommendation for companies to display information about added sugars on food labels. This will be a top priority for consumers and food manufacturers. Sweeteners that are gaining in popularity are, Stevia, Maguey Syrup, Honey, Agave and Maple Syrup. The newest introduction to the all-natural sweetener trend is the use of Monk Fruit. Turmeric is a culinary spice native to Southeast India. It is a plant of the Ginger Family. Turmeric has a peppery, warm and bitter flavor and a mild fragrance slightly reminiscent of orange and ginger. It is best known as one of the main ingredients used to make curry. Because of its deep yellow-orange color, Turmeric was traditionally called, “Indian Saffron.” Turmeric, the bright yellow of the spice rainbow has long been used as an Anti-Inflammatory Agent to treat a variety of conditions. Consumer’s expectations demand sustainable earth-friendly products with a transparency about what they are consuming, where the product is made and clarity about what they, the company stand for. Labels will move from clean to clear with simpler claims and packaging. Biodegradable and reusable are likely to expand. Food manufacturers will undergo a similar transformation as companies are taking it upon themselves to align with the shifting expectations of the consumer along with the FDA Label Overhaul. Processed foods can vary slightly, but it usually refers to foods that are packaged in boxes, cans, bags or packages. These foods need to be processed extensively to be edible and are done so by adding additional ingredients that are usually unpronounceable. These additions then change the food from its original natural state. You can determine whether a food is processed by looking at the ingredient list. The longer the ingredient list, the more processed a food is likely to be. The more processing steps involved the more nutrients and vitamins are then lost. Processed foods are usually found in the center aisles of the grocery store and are more likely to contain ingredients that are unrecognizable such as preservatives, food dyes and chemicals. These are not real food ingredients that you would cook with at home. Processing also refers to the structural change in some foods like crackers. These usually have Trans fats added to increase their shelf life. Trans fats are created when vegetable oils are overheated and the molecular structure of the fat changes. Trans fats are linked to serious diseases like heart and cancer and should be avoided. In other words, processing usually means removing nutrients, swapping good nutrients for bad, increasing calorie content and removing other valuable things like fibre. 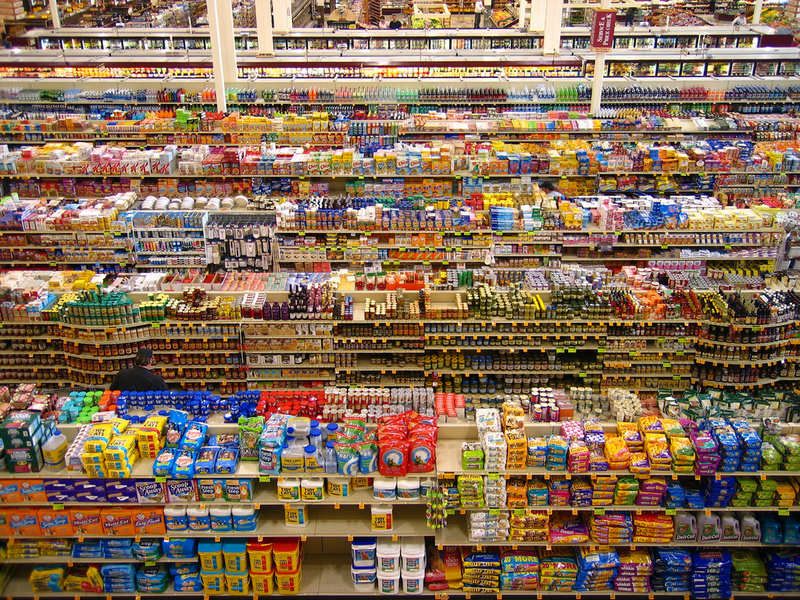 Did you know that 90% of the food in grocery stores is processed? 70% of the average American’s diet is made up of processed foods. In 2007, I made the decision to eliminate the majority of processed foods from our diet and that percentage was 70% of what we were consuming. Processing affects the taste and properties of the food. Food manufacturers will then add cheap or artificial ingredients such as sugars, salt, fats or additives to restore the lost flavor properties and improve the texture for appearance and to extend the shelf life of the food. Did you know that 100 years ago, the leading cause of death in my grandparents generation was infectious diseases. They ate a lot more whole foods, with higher nutritional value. Obesity wasn’t a problem. Convenience is the main drive for processed foods. Food travels long distances and it sits in supermarket shelves for long periods of time and so preservation and safety concerns regarding some foods are an issue. Processing is used to kill harmful bacteria and other microorganisms in order to extend the shelf life. • Reduced Fat foods must have at least 25% less fat than regular versions of those foods. Fat-Free also lacks in taste and flavor and to make up for that, food makers will add other ingredients like sugar, flour, thickeners and salt and this adds calories. The foods are usually not appealing and less satisfying and you end up consuming more of them. • Canned foods that are high in sodium or fat. • Flavored chips, crackers and snacks. • Processed meats – Look for meat labeled, Minimally Processed. • Most condiments including bottled sauces, dressings, marinades, pre-flavored packaged products and boxed foods. • Any products that specifically list these ingredients on the label: MSG, Corn Syrup Solids, Yellow 5&6, Blue#1, Red40, artificial colors and sweeteners. Take A Reasonable and Practical Approach (Baby Steps Here Or You Will Get Discouraged)! It’s important to understand that you are not going to eliminate everything, but you can significantly reduce it! You have to take a practical approach and eliminate what you can, and then look for healthier alternative products. Incorporate the use of fresh ingredients, like fruits and vegetables. Cook more at home and look for healthy recipes that contain minimal ingredients. Plan ahead and prepare meals in advance. Eliminate Fast Food!! If this is the only thing you end up eliminating altogether, trust me when I say you will notice a huge difference in the way you feel and your body will thank you! If you have any questions or you just need a little encouragement along the way….I’ll be there for you! I’ve been through this myself and the most difficult step is going to be the first one. It does get easier and you will feel better and have more energy. Send me an email at [email protected] and let me know your progress. I’d love to hear from you! CONTEST! Guess The Product – Win That Product Giveaway! The New Addition to our Culinary Line is almost ready for launch! We’re hosting a Product Giveaway and you will need to head on over to our Facebook Page to Participate! 1. Contest Clues For Guess The New Product… Will Be Posted On Our Facebook Page. 3. Sharing clues and /or interacting with other people is highly encouraged. 4. You can work in teams to come up with the answer or participate individually. 5. Keep Track Of The Clues Posted. 6. Use The Clues And Correctly Guess The New Product…Win The Product! Starting Thursday, May 15, 2014 we will post a clue on our Facebook page. The clue describes something about the new product line. We will randomly add new clues and continue to post them on our Facebook page. You will need to keep track of each clue. Each clue will be a little more specific about what the New Product May Be. You will need to use the clues and then tell us what you believe the product is. Be specific. The contest will end on Thursday, May 22, 2014 at 11:59PM MDT. All correct answers submitted either by email and/or posted will be chosen at random and we will pick 4 winners!